It may have taken a late flurry, but Tim Murray put his stamp on the organization with a firm, aggressive series of trades around the 2014 trade deadline. A look at the players and picks that have come and gone since the start of the 13-14 season. I consider a lateral move one that saw the Sabres acquire and flip a player for additional assets. He got started early by sending Ryan Miller and Steve Ott to St. Louis on Friday and threw his hat in the ring with one of the earlier trades on Wednesday. Murray shipped Brayden McNabb, two second round picks and Jonathan Parker to Los Angeles for Hudson Fasching and Nicolas Deslauriers. Murray’s punctuated his first deadline with two 11th hour deals involving three of this pending UFAs that ensured previous investments would continue to pay dividends. After finding a dance partner to take Matt Moulson (and Cody McCormick), Murray managed to flip Jaroslav Halak for a younger goaltender with term. It was a productive deadline that provides the framework for the way Murray will shape the roster through the 2014 and 15 drafts. Two drafts that will see the Sabres make four (possibly five) first round selections. 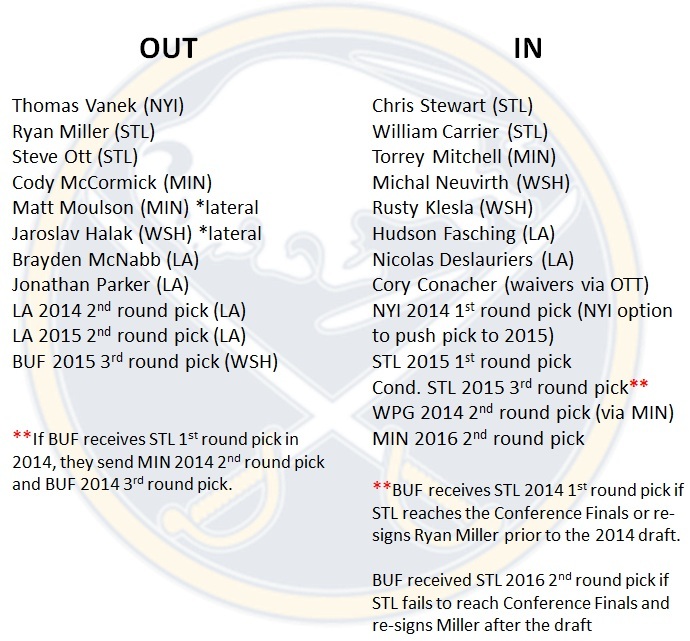 Buffalo holds additional picks throughout the 2014 and 2015 second round and despite shipping two of them to Los Angeles along with McNabb, Murray came out even after pulling two second round picks in exchange for Moulson. I thought he put it well when he said the team was helped more by the two forwards acquired from LA. While returning the two picks obtained for Robyn Regehr leaves Buffalo with nothing from that trade, the original acquisition that brought Regehr to Buffalo sees the Sabres come away with Fasching, Deslauriers and the draft pick that became Jake McCabe in exchange for Paul Byron, Chris Butler and Brayden McNabb. All-in-all it’s not the worst return ever. The best return of the trade is seeing the Sabres manage to flip a position of strength for depth elsewhere. McNabb had been passed on the organizational depth chart by a number of younger talents and although he was still performing at a high level, he was an expendable talent. With Mark Pysyk, Rasmus Ristolainen, Nikita Zadorov and Jake McCabe all in the pipeline, the Sabres aren’t short on defensive prospects. Meanwhile, Fasching is already showing the ability to produce at a high level and Deslauriers provides additional size and depth down the wing. Deslauriers also brings immediate help to Rochester as Murray is keeping his young, talented prospects away from the nosediving NHL franchise he is no presiding over. It’s the same strategy employed by Ottawa during his time there as the Senators kept their top prospects stashed on a talented Binghampton roster as opposed to a losing atmosphere as the parent club retooled. Joining Deslauriers, for now, will be Rusty Klesla, an interesting addition to the Halak/Neuvirth swap from the Capitals. Klesla was once a talented, highly sought after blueliner but is a shell of the player who gained prominence in Columbus. Klesla will add even more stability to a very talented Rochester blueline and could certainly see some time in Buffalo as the season winds down. The Neuvirth trade is all about upside and maximizing return. Trading Miller and Ott was an inevitability. By flipping Halak for two more bodies sees the Miller trade net Buffalo six assets in total as Neuvirth still has term on his deal. Neuvirth will step in as Jhonas Enroth’s backup but he’s certainly going to push for time. There was a period in which Neuvirth appeared to be ready to take over the crease in Washington before a regression saw him passed by Braden Holtby and Phillipp Grubauer. Neuvirth’s a cheap backup who allows the Sabres to keep Matt Hackett and Nathan Lieuwen in Rochester without having to throw them to the fire that will be the rubber factory that is the Sabres defensive zone. If Ted Nolan and Jim Corsi can reshape Neuvirth he very well may earn a new deal come next summer. Worst case scenario is that he serves as a stop-gap into the 2015 offseason. Giving up a third round pick along with Halak to swing the deal seems like an overpayment, but at some point the picks need to turn into players. If Neuvirth has to be that pick then so be it. Once again, it’s all about maximizing the return moving forward. The last trade might be the most interesting as the market that shaped out over the course of the day significantly altered the expected return for many players who were on the block. Although Moulson wasn’t turned into another first round pick like what was originally spitballed when he was first acquired; the return washed out the loss of the picks sent to Los Angeles. Additionally, Torrey Mitchell is a far more serviceable bottom six forward – as if they needed any more – than what Cody McCormick was. That’s particularly true with John Scott and Zenon Konopka both on the roster. Mitchell could easily fill a role on one of Buffalo’s top three lines but he might end up on the fourth line since Drew Stafford and Chris Stewart will each contend for top-six time while Matt D’Agostini and Brian Flynn both have earned their respective roles. Newly claimed Cory Conacher will get a look at top-six minutes in Moulson’s role and should get every opportunity to reclaim the potential he showcased in Norfolk and Tampa Bay. It’s hard to proclaim the Sabres winners at the deadline simply because they’re in 30th place and there’s obviously no intention of changing that. However, Murray has positioned himself very well with four guaranteed first round picks and five more guaranteed second round picks in the next two drafts. He added two forwards, one of which is two years into his development, and another who’s showed tremendous growth since his draft. Murray did his duty in moving five pending UFAs and flipping depth for an organizational need. It’s not a deadline that was going to produce immediate returns. The draft will not only yield an organizational cornerstone (#SuckforSam) and serve as a springboard for additional trades. I give Murray full marks for the moves he made on Wednesday and for what he is set to do in the next 18 months. Previous Article Where are the Sabres picks? What role do Adam, Armia, Grigorenko, and Larsson fill when we now have Fasching, Carrier, Compher , Deslauriers , and a bevy of high profile picks coming? Are we looking at more wheeling and dealing this summer? With Fasching and Compher in college for at least one more year there’s little to worry about with those two. Larsson will remain as a high-profile prospect moving forward and could see full time work in the NHL next year. Carrier will play his first pro season in Rochester in 2014-15 and Armia will continue to season in the minors as well. Grigorenko’s final ELC year will be spent in Rochester and the future there is fuzzy. Adam is the only one who may end up being passed on the organizational depth chart as it seems like he’s the lone body without a definitive future.